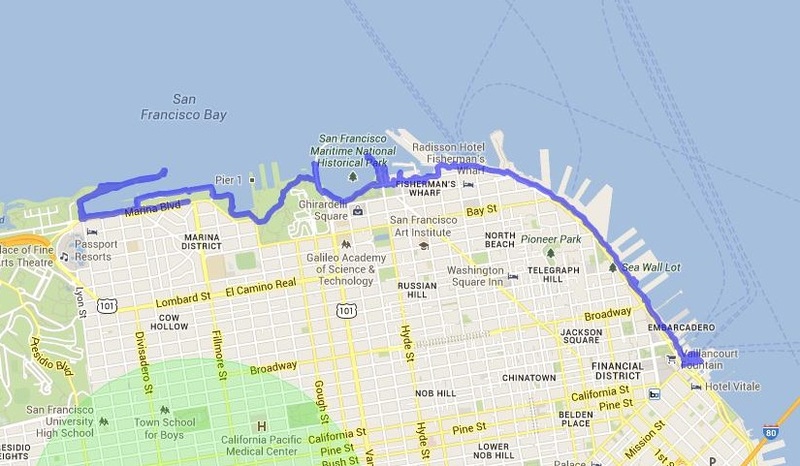 Maps, Hike Stats and Transportation – The San Francisco Bay Trail: It's Closer Than You Think! For all transit schedules and stop locations, please go to 511.org to get the most up to date and accurate information for your own journeys. *On some transit lines, such as Golden Gate, you must scan your Clipper Card when you off-board as well as when you on-board. There were some sections of the Bay Trail such as Highway 37 or the Lincoln Highway along San Pablo Road that are still in the planning stages and were either not accessible or safe for pedestrian access at the time of my trip. In these cases I received assistance to get to the next trail head. Transportation to start: SF Muni 1 California to Drumm, walked one block to The Bay Trail. Transportation home: Golden Gate Ferry Service from Larkspur to San Francisco Ferry Building. Transfer to 1 California line. 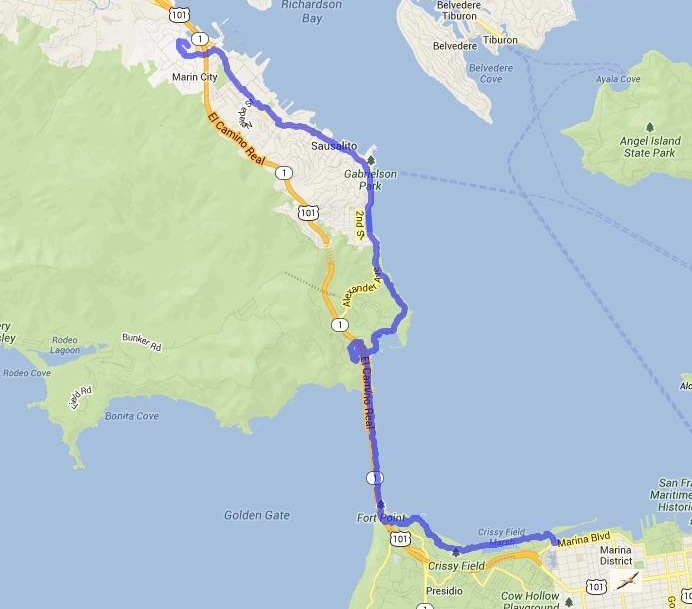 NOTE: I highly recommend turning left after the first mile onto Anderson Drive then right onto Bellam to get to the San Rafael Bay shoreline, rather than taking the freeway on-ramp shoulder as I did and is shown on this map. The shoulder is not safe and cars travel at very high rates of speed here. Also, from Pickleweed Park I did not follow the existing Bay Trail but rather tested a proposed trail. From Pickleweed Park, I recommend heading south on Kerner for about a half mile then right onto Bellam, go under the freeway and turn right onto the Bay Trail which follows Anderson. Transportation home: Marin Transit from McInnis Park (Yosemite and Smith Ranch Road) to San Rafael Transit Center ($2, no Clipper on Marin Transit) then transfer to the Golden Gate Transit 101 Express. Ride to Lombard and Fillmore was less than 20 minutes! PLEASE NOTE: June 6th is my one and only designated drive day. There is no pedestrian access to Highway 37 and Public transportation does not service the Sonoma shoreline, therefore I drove to these sections as well as to the two northern most legs, McInnis Park and Hamilton Wetlands Restoration, which I folded into this day. Transportation home: The Lincoln Highway (San Pablo Blvd.) section of the Bay Trail just south of the Carquinez Bridge is still in the planning stages. There is no safe pedestrian passage along this road. I received assistance at this point and was dropped off at BART for my trip home. For bus service, WestCat offers connecting service to BART in Western Contra Costa County. Please go to 511.org for information on stop locations and times. Since the Bay Trail section connecting Vallejo to Glen Cove and Benecia is still in the planning stages these areas are inaccessible from Vallejo on foot. I received assistance to get to Glen Cove. On weekends I recommend bringing your bike on BART and riding to the shoreline where there are miles of unpaved trails that are bike friendly. Transportation to start: San Francisco (Embarcadero BART) to Hayward BART (No weekend bus service to HSIC) On weekends I recommend bringing your bike on BART and riding to the shoreline where there are miles of unpaved trails that are bike friendly, otherwise it is a $30 cab ride. Transportation to start: San Francisco (Embarcadero BART) to Fremont BART to AC Transit 212, Offboard at E. Tasman and Cisco in San Jose, Walk about 300 yards east to Coyote Creek trail head then north for 1.7 miles north along Coyote Creek Trail until you reach the Bay Trail trail head at N. McArthy and Ranch Dr.
Transportation home: Redwood City CalTrain to San Francisco CalTrain. (Appoximately 1 mile to BayTrail) Alternatively, SamTrans 270 bus from Bayfront Park to Redwood City CalTrain.